"Art will wake you up. Art will break your heart. There will be glorious days. If you want eternity you must be fearless." 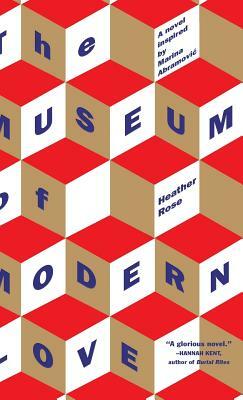 --Heather Rose, The Museum of Modern Love Our hero, Arky Levin, has reached a creative dead end. An unexpected separation from his wife was meant to leave him with the space he needs to work composing film scores, but it has provided none of the peace of mind he needs to create. Guilty and restless, almost by chance he stumbles upon an art exhibit that will change his life. Based on a real piece of performance art that took place in 2010, the installation that the fictional Arky Levin discovers is inexplicably powerful. Visitors to the Museum of Modern Art sit across a table from the performance artist Marina Abramovic, for as short or long a period of time as they choose. Although some go in skeptical, almost all leave moved. And the participants are not the only ones to find themselves changed by this unusual experience: Arky finds himself returning daily to watch others with Abramovic. As the performance unfolds over the course of 75 days, so too does Arky. As he bonds with other people drawn to the exhibit, he slowly starts to understand what might be missing in his life and what he must do. This is a book about art, but it is also about success and failure, illness and happiness. It's about what it means to find connection in a modern world. And most of all, it is about love, with its limitations and its transcendence.